Check out the latest Church’s Chicken Coupons and Menu Specials. 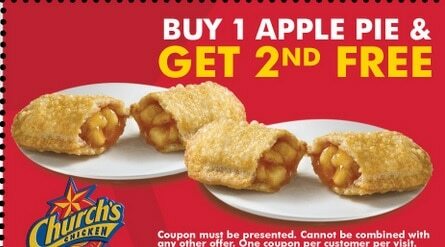 Don’t miss the current coupons, promo codes & menu offers, available at Church’s Chicken Canada restaurants. The restaurants serve chicken, desserts, sandwiches, sauces, sides & wraps. The restaurants hand-batter every piece of chicken, making them in small batches all day long, so they’re always hot and fresh. Church’s Chicken is a fast food restaurants chain that offers fried chicken, in more than 1,700 locations in 25 countries, and one of the biggest chicken restaurants in the world, behind KFC, Popeyes, and Chick-fil-A. How to get more savings at Church’s Chicken Canada restaurants? Church’s Chicken Coupons – Use the monthly coupons to save when ordering at Church’s Chicken Canada locations or online. Savings include BOGO Free Offers, Buy 1 and get the 2nd with 50% OFF or buy 10 and get 10 Free. Save every day with the restaurants specials on fried chicken, that is hand-battered, marinated for 12 hours, and very spicy. Also, get the new Buffalo Jack Burger, Spicy Tenders – Boneless all white meat chicken tenders with the signature spice.